We’re in the midst of a US invasion. It’s what I like to call the Pumpkin Spice Takeover. It started with a latte and has quickly expanded into soup, oreos, bagels, vodka, tea and houmous. Houmous? I mean really? Pumpkin flavoured coffee sounded bad enough. While I’m not as fanatical about pumpkin spice as some Instagrammers appear to be I do appreciate how it heralds the start of a new season. Starbucks and their pumpkin spiced lattes (or PSLs to use the hipster vernacular) are as ubiquitous to Autumn as the minced pie is to Christmas, and that’s an accomplishment not to underestimate. Yet, just as minced pies can only be eaten in December, pumpkin spice can only be enjoyed in Autumn. I’m sorry, but if we want to continue this trend of food items acting as a beacon of welcoming in the seasons, then that’s the rule. Now I don’t know the official dates of Autumn but so long as Autumnwatch is on BBC2, I’ll use that as my official guide. So you’ve got 4 weeks left to enjoy my pumpkin spiced bites before it’s all over until next year. 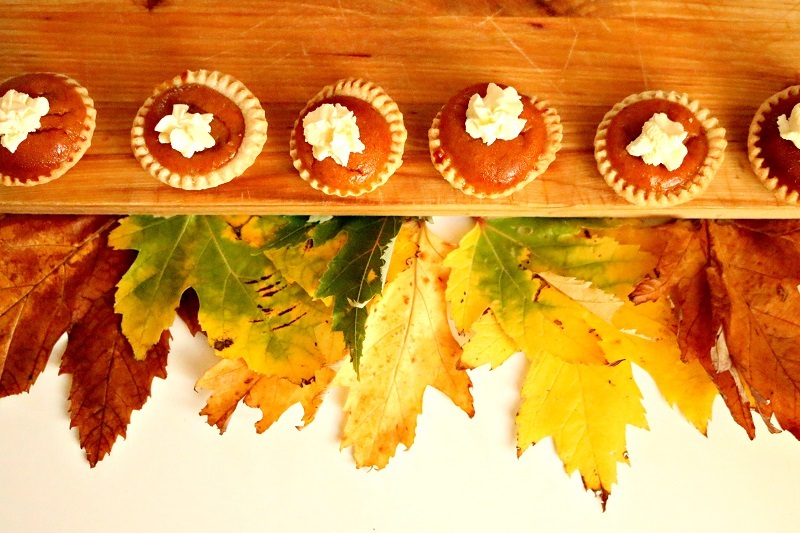 These pumpkin spiced bites are just dinky versions of the Hummingbird Bakery’s pumpkin pie. Despite appearing all dainty and fiddly I find them a lot easier than a large pie, purely because I’ve eliminated the whole blind baking malarkey. Unlike America we don’t really use this vegetable other than carving jack-0-lanterns each Halloween and I suspect even the idea of a pumpkin filled pie is off-putting to most Brits. Let me reassure you now, if you like gingerbread or ginger loaf or ginger snap biscuits then chances are you will like pumpkin pie. It’s pretty much the same flavour. Just don’t be put off by the idea of tackling a whole pumpkin, I use a tin of pumpkin purée (because why wouldn’t you?) which means considerably less hassle & mess. 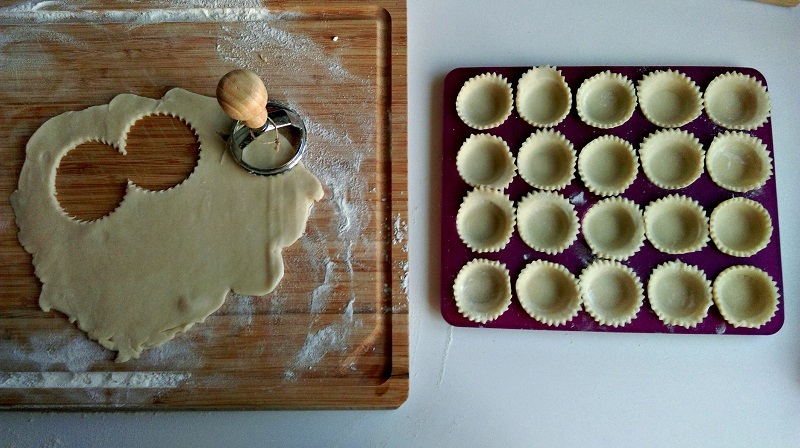 This recipe will make approx 40 – 50 mini tarts. You can however use the same quantities to make 1 large pie. Details are at the end of the post. Heat the oven to 170C. Lightly dust your work surface with flour and cut the block of shortcrust pastry in half. Roll out 1 half of the block until its approx 3mm thick. Stamp out rounds using the scone or pastry cutter. Save the remaining pastry for the next round of tarts. 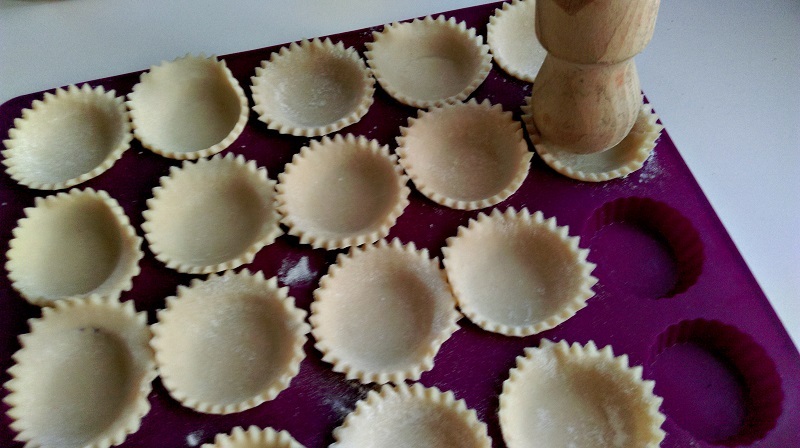 Lay each pastry round into the tartlet mould & gently press them down with the back of the rolling pin. Pop this tray into the freezer for 15 – 20 mins. In a large bowl add the egg, pumpkin puree, condensed milk, sugar, salt, spices and flour. 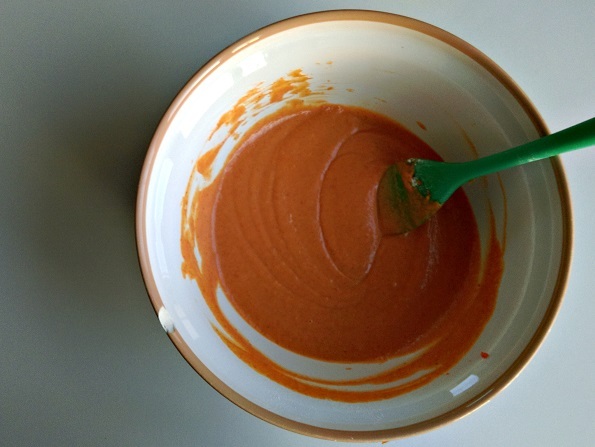 Mix with a spoon or whisk until combined. Remove the pastry tray from the freezer and set it on a sturdy baking tray. Using a teaspoon, spoon the pumpkin filling into each of the cases. I found 1 and half teaspoon of filling was plenty. Bake for 40 – 45 mins. Once baked, remove the tarts from the oven & serve warm or leave to cool. While they are cooling you can now use the tray to make the next round of tarts with the leftover pastry & filling. Once the pies have cooled, whip the cream with the icing sugar and spoon into a piping bag with a star nozzle. Pipe a small amount of cream on top of each pie. You can serve now but they do taste better having been chilled in the fridge a little. Half an hour should do the trick. To Make a Large Pie: Roll the pastry out to fit a large tart tin. Cover the pastry with a sheet of baking paper & fill with baking beans. Bake the pastry at 180C for 20 mins then remove the paper & beans & bake for another 10 mins. Pour the filling into the pastry shell & bake for 40-45mins. Once cooled, decorate with piped whipped cream or a dusting of icing sugar & ground cinnamon. The leaves are optional. Have you fallen victim to the pumpkin spiced craze? If so, what’s your favourite pumpkin spiced food/drink? Are you an American, living in Britain, who misses the patriotic eating of pumpkins? Let me know your thoughts!